A complete archive of all past ITA Journals & Newsletters is available in a digital format to all ITA members in the Members Only section of the website. A regular ITA membership includes a paper version of the ITA Journal and access to the online version. A full searchable index is available. The online Journal is a quick and convenient way of reading our magazine – no waiting times for shipping, no storage issues and an environmentally friendly approach by not using any paper. 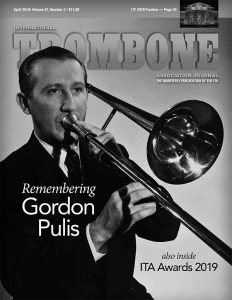 Please feel free to try and test the digital format by accessing our complimentary copy of the 2009 October issue of the ITA Journal: iPad & iPhone supported! Do you need an older issue? All past Journals and Newsletters have recently been made available to online to members. If you want to find out what the online Journal looks like, please visit the test page. You can also order paper back issues by mailing in the back issue order form. Longtime ITA members frequently comment and offer compliments about the evolution of the organization’s printed materials over the years. On the occasion of ITA’s 40th anniversary, it seems appropriate to retrace this evolution and acknowledge those who helped bring us to our “slick” Journal of today. The ITA Journal has been in production since 1971 with a series of newsletters printed from 1973 to 1980. 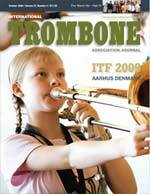 Published quarterly since 1982, it is edited by Diane Drexler and includes scholarly articles, trombone news, job announcements, and literature and record reviews.